ANNOUNCING ZUMBAR PRESS' FIRST BROADBOOK! 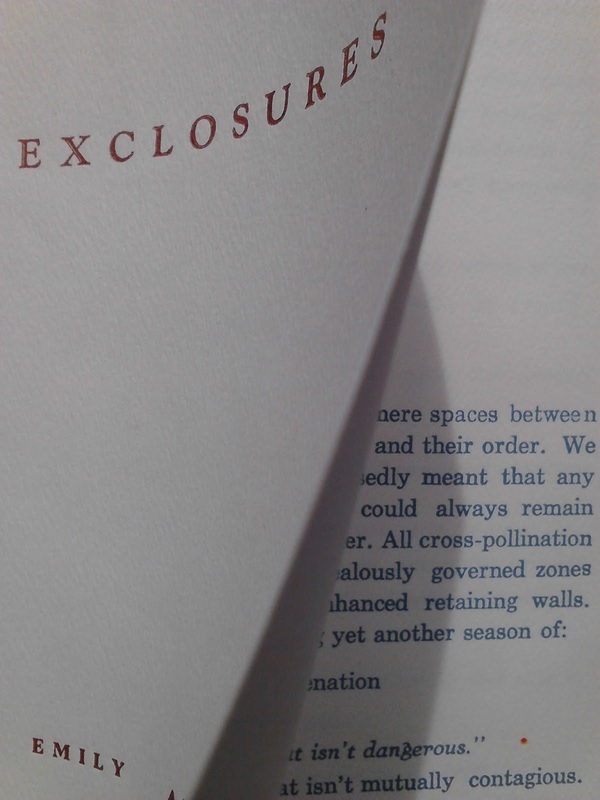 After a slow, year-long conversation with this particular body of work, selections from Emily Abendroth's EXCLOSURES has finally spiraled itself into Zumbar Press' first broadbook (broadside + chapbook)! This 6-page, hand-sewn book is printed in duotone and it dialogues with both worn and damaged type, along with new, never-before-used type, textually exploring a number of different themes through these fonts. As with all of Zumbar's poetic objects, this book is limited in number, so be sure to visit claiming some zumbar to order your copy today. Spiral on to read an excerpt! Printer, you begin a new printing adventure with the idea of a broadbook, a book that is shorter than a chapbook but longer than a broadside. You imagine the pages of this new poetry object to unfold in simple accordion style, stitched in such a way so that the unfolding occurs at the bottom and top of each page, for a kind of raw unspiraling. In printing, you have realized that you must work from the end of the mind's eye and come forward to the front where the reality of what you can do or are doing with the printed object has become (or is becoming). In short, you learn to work from the back forward to avoid making irreversible mistakes. Announcing a NEW poetry broadside! Translations of Catullus 99, CONSONANCE and VULNING, by Divya Victor! Zumbar Press is exhilarated to be spiraling forth with new work by poet, Divya Victor! 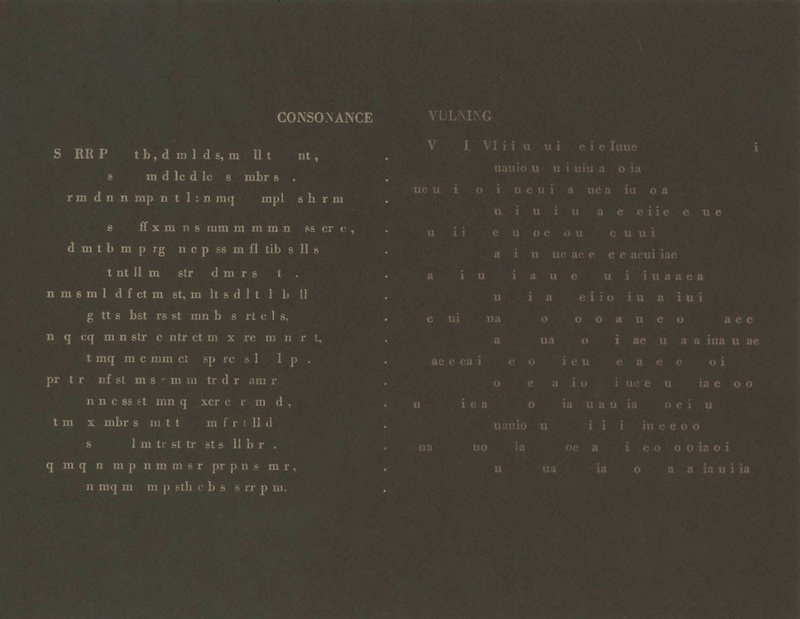 After months of working on this spiralifically, beautiful poetic object, Divya Victor's broadside, which is made up of two translations of the poem, Catullus 99, and are titled as CONSONANCE and VULNING, has stealthily arrived, hot off the letterpress! The print run for this particular broadside is low, so be sure to embrace your copy soon by zumming over to the claiming some zumbar page! Printer, you work with what the eye sees when an object is held at a horizontal level. If what your eye sees is a pulled proof of a work that is not off center or having uneven margins, your desire to follow the impulse to readjust the type in the chase is not necessary. But printer – you also work with what the eye should not see as well. A reader of the work you print should not see or notice the type face you have used; the attention of the eye must fall elsewhere. 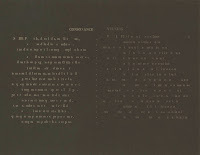 Type faces are to be readable and understandable, hence – invisible. Many a contemporary type face serves to dazzle the eye – to distract it away from the language and the meaning embedded within the text and to pull it toward the design of the face. But what of the history of the face? And what of the choice made for each letter under this face? How do you represent a type face that is designed not to be seen? 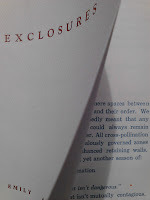 Perhaps this is spoken through the inking on the page, and with that, how each piece of type can take the inking. 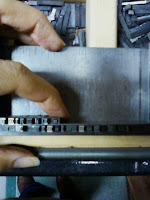 Let the invisibility of such type face be made visible here as you speak the process of working to ink pieces of Bodoni type from a worn set. Printer, you work within doubled invisibility. Printer, you are sensing through the tactility of setting type that the name for this action is a sobriquet for it being another form of translation. Something awakens this realization during your encounter with VULNING. What calls your attention to each tiny piece of manipulated lead to see it first in its origins as type and then as letter before it becomes word? Which root in this object’s history holds more weight and with such weight has been silently demanding to be seen through other printers’ hands and eventual readers’ eyes? Printer, now you sense the eye and hand are translating together. The eye is the vowel and the hand, the consonant. Both encounter weight. 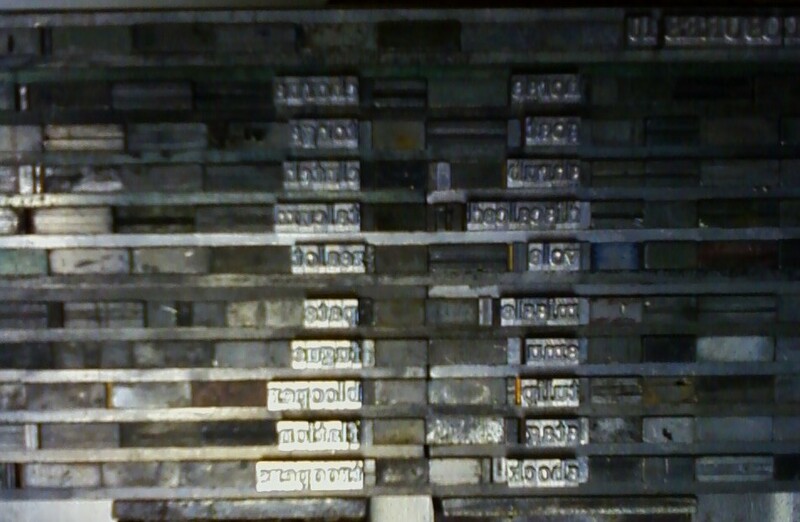 Printer, you have decided with the poet to print these translations side by side as blocks. As such, they will push and pull, becoming a dialogue that breaks from a call and response, a dialogue that dares to be transparent or reflective as side by side mirrors or windows. Here, these two voices will sit along the same horizon. Here, these two voices will be equal and will arrive from the same mouth and share the same saliva. They will lend themselves to the mouths of everyone, and it will be along this plane where we will all commit the same act of violence against the text, against these voices as we read them aloud. You see how these blocks of text mirror blocks of type, and you wonder about the influence and if their structure can be translated.